I realized that the last few weeks have been spent more on commentary than instruction. So today, let’s take a look at a campaign artifact (in this case, the statement of someone arguing in favor of one of the Presidential candidates) to see how one of the most important critical-thinking tools – logic – can help us determine if something we believe, want to believe, or violently disagree with might be correct or not. This particular example came from philosopher Lee McIntyre (author of a recent book which should be of interest to any Critical Voter reader), and has to do with a statement made by a spokesperson for Democratic Presidential candidate Bernie Sanders. At first glance, this response seems to make sense, and might go a fair way towards responding to the original question, since the speaker is also implying that a Democratic-controlled Congress would be amenable to voting in Sanders’ programs. But logic is meant to help us check such first impressions by applying structure to what is being claimed and then checking to see if those claims lead reasonably to a proposed (or implied) conclusion. In this case, an A statement along the lines of “All elections in which Bernie Sanders is elected President of the United States are elections in which Democrats will be elected to control both houses of Congress” seems to represent a reasonable translation. 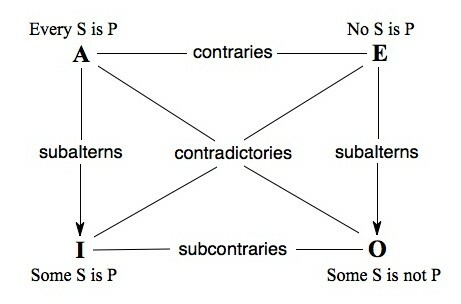 In addition to the notion of A, E, I and O statements, Aristotle also proposed something called the “Square of Opposition” an illustration of which appears at the top of this piece. Now no need to freak out (or assume you need to understand what every term in this diagram means). For the key point that will be useful in this example is that “contradictories” (i.e., statements in diagonal opposition to one another) cannot both be true. To pick a simple example, if “All dogs are animals” (an A statement) is true, then the contradictory O statement “Some dogs are not animals” must be false (and vice versa). Now if you look at those two statements, the second one (the O statement that has Bernie elected, but not with a Congressional Democratic majority) seems the more plausible, if only because it’s predicting just one event of limited probability versus two. And if we decide that the O statement is more likely to be true, then we have automatically determined that the more optimistic A statement (that has Sanders elected with a Democratic majority) is more likely to be false. The reasons I had to use the terms “likely” and “unlikely” in an analysis meant to demonstrate truth or falsehood is that the data needed to determine if either statement is true or false won’t exist for many months since the events that will generate confirming facts will happen in the future. But all is not lost! For another method for applying logic to everyday utterances can help us determine the strength or weaknesses of the President Sanders = Democratic Congress theory without having to wait until Election Day. And it is to that method we shall turn to next time.